From Hope you may take Highway 5, The Coquihalla, to Merritt and Kamloops (High Country) (2 hours). You will travel over dozens of bridges and overpasses on this journey from the coast to the Cascades and into the semi-arid Fraser Plateau. From Merritt continue on Highway 5 to Kamloops. To the Okanagan take Highway 5A and 97C (the Okanagan Connector) or Highway 3, known as the Hope Princeton Highway or the Crowsnest Highway . To travel the Fraser Canyon from Hope, take Highway 1 (Trans-Canada). This winding section of Highway 3 leads to the West Gate of Manning Provincial Park (with four campgrounds and facilities) which is 26 km (16 miles) from Hope. 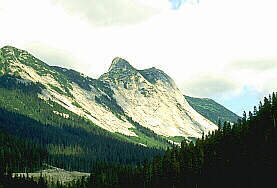 To the northern border of the park is the Cascade Provincial Recreation Area which may be accessed by horseback or on foot. Further along Highway 3 is Allison Pass, the East Gate, Copper Mountain Viewpoint and Princeton (Okanagan Similkameen).